Pre-Amble: The Toronto Blue Jays have lost 2 in a row, 8 of their last 10 and are now 11 games back of first place in the AL East and 6.5 games back of the 2nd wild card spot and it is May 25th :( On the other hand, the Phillies are 28-19! Who saw that one coming? Good for them. Of Note: Jays starting pitching has struggled this season to say the least. Both Sanchez and Estrada pitched just 5 innings each these past 2 losses. Lets hope sweet Sammy G can take us to the promise land tonight or we may need Morsel to grab a rosin bag again. For a little bit of positivism (is this a word? )...here are Vlad's stats to date! I cant find his WAR, does such a thing even exist for MILB? If someone finds it, post it! And now back to our regularly sceduled negative programing.....a new feature! 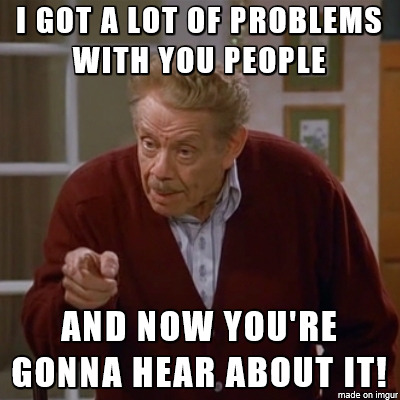 ....The Airing of Grievances! in which we discuss who has disappointed us lately. This week Clippy made 4 appearances. He pitched 3 innings giving up 5 walks, 5 hits and 10 RUNS! He finished the week 0-2 with 2 blown saves and an 18 ERA over that span. Sub-optimal. The Blue Jays "defacto ace" is 0-5 this season with a 7.71 era, a 1.74 WHIP and a whopping -0.8 WAR! The subbist of optimalist. He is currently on the DL with "shoulder fatigue" so take that as you will. Sadly his trade value has never been lower so all we can hope for is a slight return to 2017 form. This is your game thread "lets just go out there and have some fun" edition.